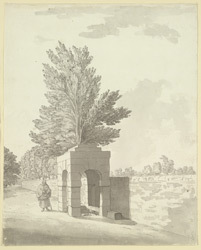 A view of Robin Hood's Well near Skelbrooke in Yorkshire. This is a well house situated on the side of the turnpike road - it has four rusticated arches and is topped by 3 steps. Langdale's Topographical Dictionary of Yorkshire (1822) explains that 'a mile and a half from this piece, Robin Hood is said to have robbed the Bishop of Hereford, and about a quarter of a mile from the Well, is Bishop Tree Root. On this spot stood the Tree, round which Robin made the Bishop dance in his boots, after he had robbed him'.